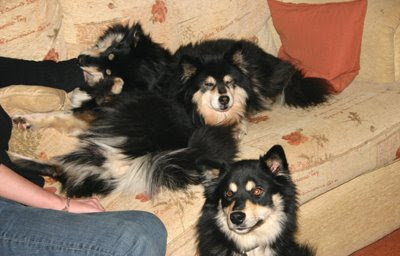 Life can be quite amusing with a pack of happy lappies. but in the meantime - "and then there were four". It is now the second morning of Smuu and Sisko's stay, well I say Smuu but, to be honest, I have now renamed her "Shadow" as wherever I go she goes too - as the matriarch of the gang she seems to have decided that I belong to her - quite flattering really. Sisko has yet to fully integrate herself into the furfamily, she is still a little put out I think from being taken from her familiar surroundings though she did enjoy being on the sofa last evening. 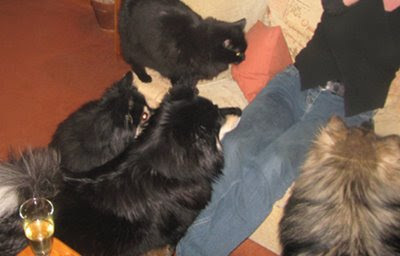 Smuu and Sisko's owner, Liz, is soon to get a cat to add to her furfamily of 3 lappies and a German Spitz Kline and is, quite understandbly, concerned as to how her dogs will get on with a purkid, well here at Dogs to Stay we like to help the owners of our guests. We have 2 cats, Sam and Lucky, brother and sister and normal moggies - they coexist with Mylo and Kiva, Sam, always ready to show them who is boss, Lucky ever eager to shove her bottom in their faces and share their food. She seems to have decided that Smuu and Sisko are no threat, likewise Smuu and Sisko have accepted that she is OK too. 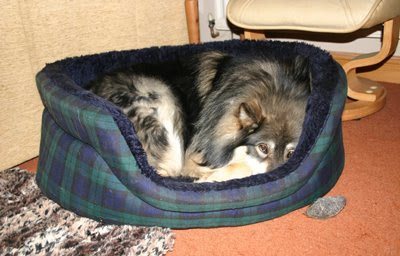 Now either that bed has shrunk (see yesterday's post) or Mylo is a big dog. At least the bed is back in its correct position - Kiva is rather keen on dragging it around the lounge. Hey - the rain has stopped and I see some blue sky - time for a walk me thinks. OK just back from our 2nd walk, just a stroll around the village after this mornings trek across the fields (memo to self, don't go for a walk with 4 lappies when the village school finishes - kids just seem to love these dogs). 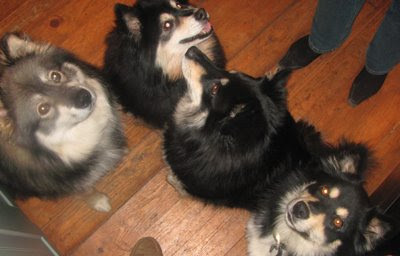 It has been said that a walk for a dog is the equivalent to a human reading the morning paper, fresh smells = new news, if that is the case why do I have 4 dogs that each want to read a different page of the paper, or in Kiva's case an entirely different paper? Two dogs on each brace each wanting to go in a different direction can be a tad of a struggle - but hay - that's what dogs are for. They say that you can't teach an old dog new tricks - in the case of the dog flaps that is so true. They also say that Lappies are an intelligent breed - well those from Surrey (Smuu and Sisko) still haven't sussed the dog flap out - give them a gap in the fence and they're through it- a clear piece of plastic in a door is an entiely different matter!